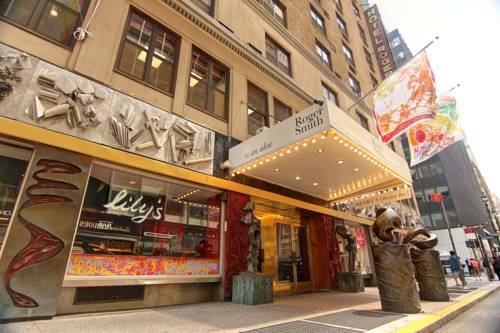 Located in Midtown Manhattan, in the heart of the New York City business district, the Roger Smith Hotel is a warm and charming boutique hotel, distinguished from the glut of chain hotels, by delivering style, elegance, and a unique flair. Our 130 guest rooms and suites are one of a kind, all individually decorated in New England Country Home, providing the perfect ambiance for travelers visiting our great metropolis. Our passion is hospitality, and we execute this experience par excellence. Our passion is also in culture, representing the great diversity New York City has to offer. Art, Fashion, Film, Music, Pop Culture, are all on display at the Roger Smith through the many events and exhibitions taking place on property. The energy and vitality of New York City resonates within our halls, but our rooms reflect the tranquility and harmony travelers desire. Value-Added Amenities include Free Wireless Internet Access, Gym Passes to New York Sports Club, DVD Movie Rentals from an Extensive Movie Library, Free Local Phone Calls, and Yogurt, Granola, and Green Apples as a healthy snack or quick pick me up. Late cancellations are subject to a penatly charge equivalent to the first night room rate and taxes, per room. Lilys Bar, is an art inspired cosmopolitan bar offering a variety of international and domestic beers, making it the perfect meeting place for friends and family or business associates. - Omnicom Group HQ 437 Madison Ave.